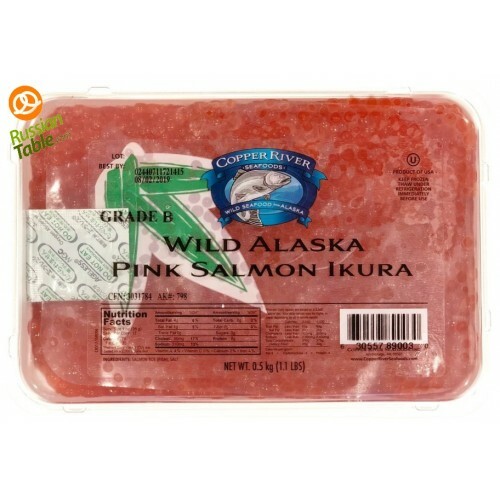 Caviar Pink (Salmon) "Cooper River" 1kg buy for 109.9900 in store RussianTable with delivery. Many species of salmon are a very popular delicacy in many countries. These species include pink salmon, silver salmon, king salmon and chum salmon. Although these are the species of salmon, there is little difference in salmon caviar. They differ in the size of roe and pigment. Among all species, Chum caviar have large roe diameter. It is also rich in taste than other species. So, if you want to taste flavorful caviar, then you can buy caviar pink (salmon) Cooper River 1kg from russiantable. How to choose salmon caviar from russaintable? Caviar is a grade for their freshness and roe, and at russiantable, you will get the fresh Caviar Pink (Salmon) Cooper River 1kg. The next thing to check is the maturity of roe. Russiantable has brought the mature roe for all the consumers of caviars. The caviar that you will get from russsiantable is well salted as per the guidelines, and thus they will stay fresh for longer. So, buy from russiantable and enjoy the flavorful caviars. Do you have any questions about Caviar Pink (Salmon) "Cooper River" 1kg?